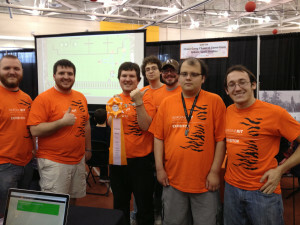 This past weekend we attended RIT’s annual ImagineRIT event, and with great success. Hundereds of people were able to sit down and play through a bit of the game, and I think it is safe to say everyone loved it. Even spectators were constantly smiling as they watched other people playing. I think that speaks to the amount of fun the game is to play if the people not playing are still enjoying themselves! We had people of every age stop by to play, ranging from about three years old all the way up to the senior citizen bracket. It was a great feeling to be able to watch people having fun with a project that we have spent the last few months on. Another highlight of ImagineRIT was our award! Our team received a Sponsor Award from the Democrat and Chronicle Media Group. We are incredibly honored to have recieved this award, as it is definite recognition that people like what are working on. There is still plenty more work to do, and I know we can’t wait to get the game out on the market. Imagine RIT Sponsor, Democrat and Chronicle, awards “Chain Gang Chase: a game from MAGIC spell studios” for innovation!